W3 Total Cache plugin improves the performance impressively. It’s one of the most functional plugin in the WP basket. Due to this, sometimes it may produce an abrupt notification. Our current blunder is one of them. Corrupted object-cache.php makes the W3 Total Cache to push following notification message. 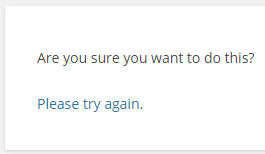 The error could solved by clicking the button ‘Yes, remove it for me’ and empty all caches. However, most time clicking this button leads to ‘500 server warning’. Now what? You need fresh copy of object-cache.php via W3 Total Cache plugin page and download it. Extract downloaded ZIP file in your PC/Mac. Upload object-cache.php to your web server’s path wp-content/plugins/w3-total-cache/wp-content. You can use cPanel’s file manager or FTP client like FileZilla. Refresh the Admin Dashboard. However, if you seen the same notification for object-cache.php then just press the button Yes, remove it for me. This trick worked for me and hope do same for you.. all the best..!